Measure King is the faster, easier and far more efficient tape measure - no matter what the job. 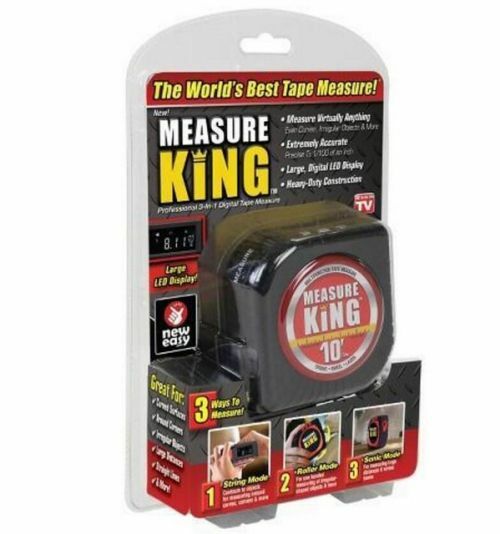 Measure King's 3-in-1 tape ensures accuracy with three ways to measure. The string mode uses traditional measuring string that is made from flexible nylon that can bend around objects. The roll mode allows you to measure curves and different objects simply by rolling it across the surface - you can measure up to 999 inches! And the laser mode allows you to measure across the room or large distances. Measure King features a bright LED digital readout, has built-in memory storage, and can easily toggle between standard and metric units.